There is something quite special about baking something for your sweetheart. 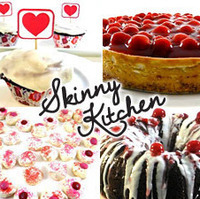 Here are several skinny treats to choose from. Most are pretty simple to make. I’m sharing such yummies as red velvet cupcakes, mini meringue kisses and dark chocolate brownie bites! This looks good to try and share wth friends and family. Thanks for sharing. Raspberry Almond Coffee Cake - A treat for Valentine's Day!